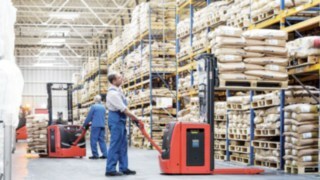 With 85 standard series and over 6,000 standard equipment variations, Linde Material Handling has the right solution for every logistics task. 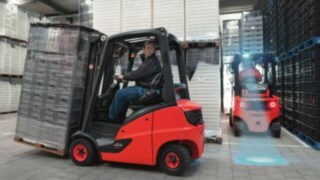 However, the equipment requirements for forklift trucks and warehouse handling equipment may change over time, for instance due to new safety regulations, modified logistics processes, or the comfort requirements of operators who operate the trucks on a daily basis. 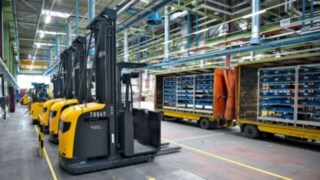 In the majority of cases, a simple retrofit helps, for example, to adapt a forklift to the new requirements without an expensive conversion or to upgrade it to the latest state of the art. You can also provide the same equipment features uniformly for your entire fleet. Linde supplies the necessary retrofit solutions and accessories for the areas of safety, efficiency and comfort. 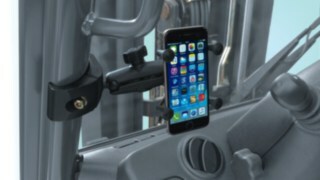 For example, these include the Linde BlueSpot™ driving path warning device, components for the automatic recording and transmission of operating hours and a practical holder for smartphones. There is no room for compromise when it comes to safety in the workplace. 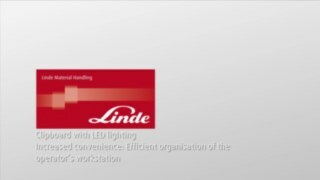 That's why Linde provides retrofit solutions from the visual warning signal through to the driver assistance system, which increase safety for operators and pedestrians in the plant. This also includes the Linde BlueSpot™ for improved visibility of approaching trucks, the Linde OrangeBelt™ for guaranteed fastening, and the Linde Speed Assist driver assistance system. Fast operation with a forklift truck means high productivity, but this must not be at the expense of safety in the workplace. Often, forklift operators are not even aware of their excessive speed. 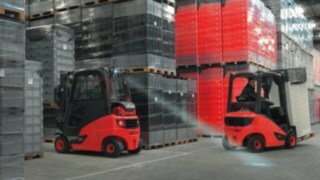 The SpeedAssist assistance system developed by Linde supports operators by automatically reducing their speed upon entry into the warehouse and production halls – in other words, wherever an adapted speed helps to prevent accidents. The range, sensitivity, and response time of modern radar sensors can be individually adapted to suit the surroundings and customer requirements. This ensures, for example, that the forklift does not inadvertently brake when travelling under bridges in outside areas. 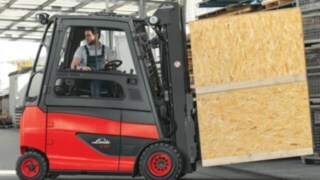 The Linde Speed Assist is easy to install, improves safety indoors, and maintains the customary high levels of efficiency of the forklift outdoors. 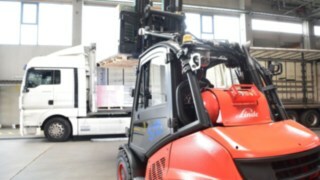 The range of solutions provided by the Linde fleet management system connect: turn warehouse handling equipment and forklift trucks into an intelligent fleet. connect: links your trucks and supplies information to guarantee efficient and safe operation. You get an overview of the truck utilisation and the servicing status, and have control over the access rights. 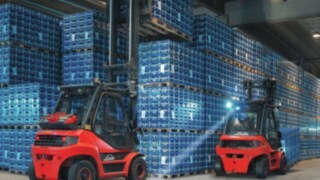 Where necessary, Linde can supply selected connect: products as retrofit solutions for existing and third-party trucks. connect: operating hours ensures that you are always aware of a truck's utilisation. Is it rarely used or has it already exceeded its intended utilisation rate? Is servicing due? Precise knowledge of operating hours enables service intervals to be planned more effectively, capacity to be optimised, and bottlenecks to be avoided. It also does away with the need for operating hours to be recorded manually. connect: trouble codes transmits error codes from the truck controller, allowing wear to be promptly identified and preventing truck failures. A clear email report informs you of the status of your trucks. If you like, the system can even automatically inform customer service. This enables connect: trouble codes to ensure that your fleet is fully ready for use. connect:ac access control means that you always know which operator is operating a certain truck at a given time. You can also manage operator authorisations and release trucks for use via PIN or RFID. Unauthorised use and lost keys are a thing of the past. The connect:an usage analysis solution shows you the usage, idle, and servicing times as well as the percentage of raising, lowering and travelling activities for every truck in your fleet. The recorded data allows you to identify the actual fleet performance and potential areas for improvement in the use and operation of the trucks. Forklift operators spend many hours in their trucks every day, making it all the more important to ensure optimum working conditions. This contributes to efficient operation and maximum comfort for operators. 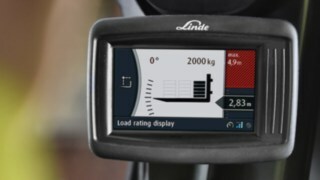 Numerous accessories allow modern Linde operator cockpits to be adapted to suit special requirements where necessary. For instance, Linde supplies reinforced padded seats and retrofitted holders for electronic devices. This enables the truck equipment to be perfectly aligned with the operator's necessary movements and their ways of working. 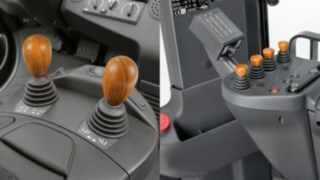 The wooden handle for Linde joysticks is a stylish way of enhancing and customising the workstation. It is available for single lever controls, central and cross lever controls. The non-splintering hardwood has numerous advantages to offer compared to standard plastic handles. Apart from the pleasant feel, it is less susceptible to contamination and protects against plastic allergies. Every wooden handle is a one-of-a-kind product made in Germany. 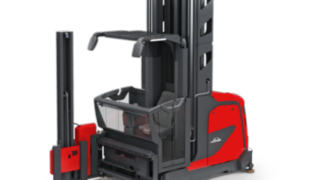 The retrofit solution for terminal holders allows existing fleets of forklifts to be easily adapted to enable use of electronic terminals. 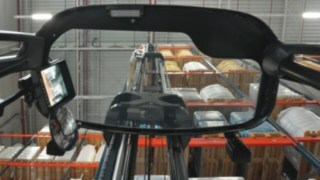 The sturdy, height-adjustable holder is simply mounted to the forklift's right A-pillar and can be tilted as required. It has a power connection and a power shut-off time for uninterrupted operation of the monitor. Forklift seats are exposed to high levels of stress due to contamination and frequent mounting and dismounting. Depending on their degree of wear, covers can become unsightly as well as uncomfortable for operators. 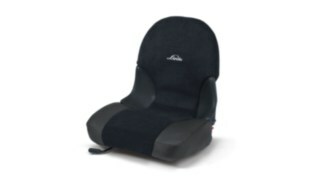 Seat covers with micro-fibre velours are extremely resilient and easy to maintain. Side inserts made of artificial leather provide additional protection against wear. A cellphone holder means that an operator always has the display in sight and can operate it with ease. 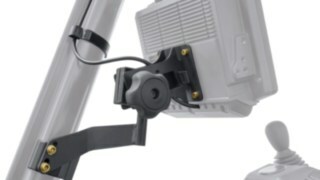 The holder, which is easy to attach via a clamp or suction cup, is suitable for all types of truck. A traditional clipboard ensures enhanced organisation and efficiency in the operator's cab at no great effort or expense, with faster access to work documents and optimum legibility thanks to the LED lighting. A clear view without turning your head, even when reversing: The rotating work station takes the strain off the forklift operator's spine. 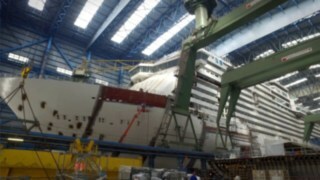 If it’s good for the operator, it also improves operational processes.